The Powers of the Loa are now YOURS! Occult expert Carl Nagel returns, this time to draw the veil away from one of the most powerful - and most misunderstood - systems of Voodoo. 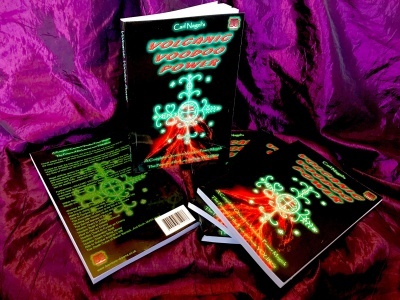 Perfect for both the total beginner and the experienced Occultist alike, VOLCANIC VOODOO POWER provides you with a complete system of Magickal Mastery the likes of which has NEVER before been seen on our Continent! Nagel skillfully guides the reader, step-by-step, through some of the most jealously-guarded secrets of Voodoo ever recorded - from making contact with the immensely powerful Loa of the Tradition, to working with Oils, Powders, Candles and Dolls - each and every resource is fully-described, and everything can be readily accomplished with household items. Furthermore, VOLCANIC VOODOO POWER contains a huge selection of some of the most dramatically powerful Voodoo Rituals EVER to be made available to members of the General Public. Whatever you seek in your life, you will find a Rite here to accomplish! Within these covers, you will find content that is available NOWHERE ELSE!